The election of Karekin II as Catholicos of All Armenians had just been held on October 27, 1999 in the afternoon when the news of a terrorist attack on the building of the National Assembly in Yerevan came to Holy Echmiadzin. At around 5:15 p.m., five men led by journalist Nairi Hunanyan, armed with AK-47 assault rifles hidden under long coats, stormed into the building while the government was holding a question-and-answer session. The group included Hunanyan’s brother Karen and uncle Vram, as well as Derenik Bejanyan and Eduard Grigoryan. The main target was Prime Minister Vazgen Sargsyan (1959-1999). According to reporters who witnessed the shooting, the men went up to Sargsyan and said, “Enough of drinking our blood,” to which he calmly responded, “Everything is being done for you and the future of your children.” The Prime Minister was shot point blank several times. Seven other people were also shot dead. The list included National Assembly Speaker Karen Demirchyan and two Deputy Speakers, Yuri Bakhsyan and Ruben Miroyan; Minister of Emergency Affairs Leonard Petrosyan, and MPs Henrik Abrahamyan, Armenak Armenakyan, and Mikayel Kostanyan. Some 30 people were injured. The group claimed they were carrying out a coup d’état in a “patriotic” act. They claimed that Armenia was in a “catastrophic situation” and that “corrupt officials” were not doing anything to find a way out. The gunmen held around 50 hostages inside the building, surrounded by policemen and army forces personnel positioned on Baghramyan Avenue. After overnight negotiations with President Robert Kocharian, the gunmen released the hostages and, after a standoff that lasted 17-18 hours, they gave themselves up on the morning of October 28. President Kocharian declared a three-day mourning period. The state funeral ceremony for the victims of the parliament shooting took place from 30-31 October 1999. Their bodies were placed inside the Yerevan Opera Theater, with high-ranking officials from some 30 countries attending the funeral. According to a poll carried out by the Center for Sociological Studies of the National Academy of Sciences on October 30-31, 56.9% of respondents said that the October 27 events were a crime against statehood and the country’s authorities, and 63.4% believed that the terrorist group consisted of assassins–traitors and enemies. A stamp commemorating the victims of the terrorist attack on the Armenian Parliament on October 27, 1999 issued by the Republic of Armenia in 2000. 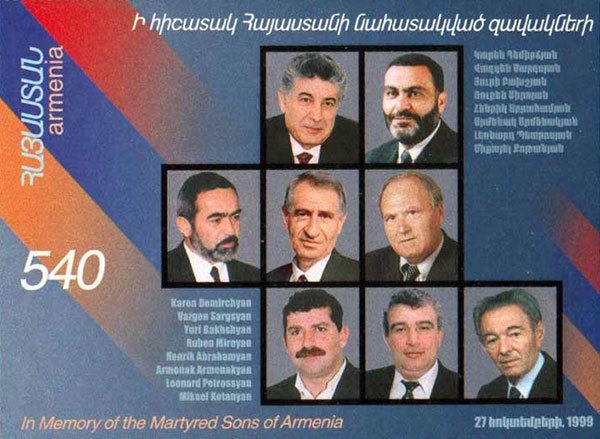 From early June to late October 1999, the Unity alliance forged by Demirchan and Sargsyan, which controlled the military and the legislative and executive branches, had become the pillar of the political system in Armenia. Their murder disrupted the balance of power and the political arena was left in disarray for months. The assassination hit Armenia’s international reputation and resulted in a decline in foreign investment. Political power was transferred to President Kocharyan. The five men were charged with terrorism aimed at undermining authority on October 29. The investigation was led by Chief Military Prosecutor Gagik Jhangiryan. At its end, the case was sent to court on July 12, 2000. The trial began on February 15, 2001, in Yerevan’s Kentron and Nork-Marash District Court. The judicial case was transferred to the jurisdiction of Prosecutor General Aghvan Hovsepyan and his office, which finally closed the case for lack of evidence. Nairi Hunanyan and his co-conspirators were sentenced to life in prison on December 2, 2003.